We have birthday and Father's Day celebrations ahead, and we're excited! How are honoring the dads in your life? We keep things pretty simple for Mother's and Father's Day, and we're looking forward to celebrating my hubby with a drive-in movie and some grill time. I feel so blessed to be married to a man who has embraced-with both arms wide open-all that is fatherhood. He pushes me to be a better mother because of the great parent that he is...supportive, challenging, cuddly, and fun all rolled into one. The kiddies and I decided to craft up something for the Best Daddy, something simple to offer him a high five for all that he does. My hubby is an amazing cook, and he can spin circles around me in the kitchen. 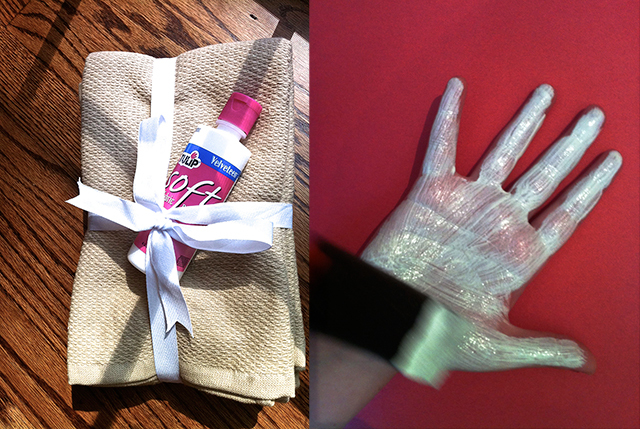 Our DIY is a Helping Hand towel for Dad. We used three supplies: three good quality kitchen towels (I chose a neutral shade to go with my kitchen), white fabric paint (color chosen to make the prints similar in tone to the towel), and a foam brush. Simple, simple...coat your child's hand in paint. Lay it on thick. It will tickle. :) Help them spread their fingers and place their hands straight down. Hold 1-2-3, and pull straight up. Follow the instructions on the paint for setting. Allow 72 hours before washing, and hover over the painted surface with a hot iron to finalize. We chose textured towels for their absorbency so I needed to go back into to fill fibers not covered by the initial print. The kids loved getting gooey, and they've all had plenty of experience making handprints, so it was a start to finish 15-minute craft. Yahoo!! 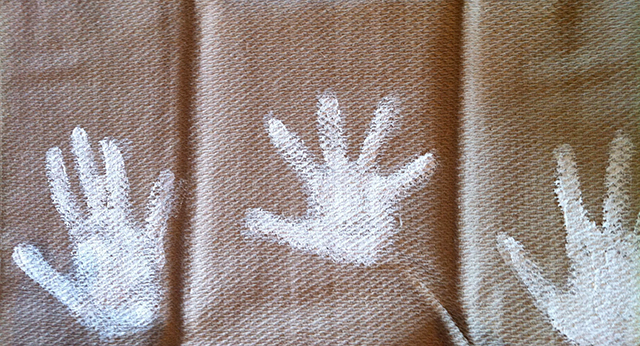 The wrinkles that don't photograph so well will work themselves out after the first wash and our darling handprints will remain. I love peeking at them from across the room and seeing the preciousness of childhood waving back at me. Happy Father's Day...to my hubby, to my awesome, fun-loving Dad, to my brother, to my father-in-law and to all you amazing, wonderful men who complete the great story of parenthood. We adore you. Have a bright weekend, friends. Can't wait to show you what's in store for next week. Happy summer! PS. One of my blogging goals was reaching yesterday! Gabrielle at Design Mom published my response to one of her Design Mom Asks. Design Mom was the first blog that I followed, and I've been faithful for years. So, when she opened up the chance to respond to a GREAT BIG question, I gulped down that bait. I'm embarrassed to tell you how long I spent on my answer, but then again, when you see the question, perhaps you'll agree that the topic is one we should probably all mull over. Cheers! Check it out.